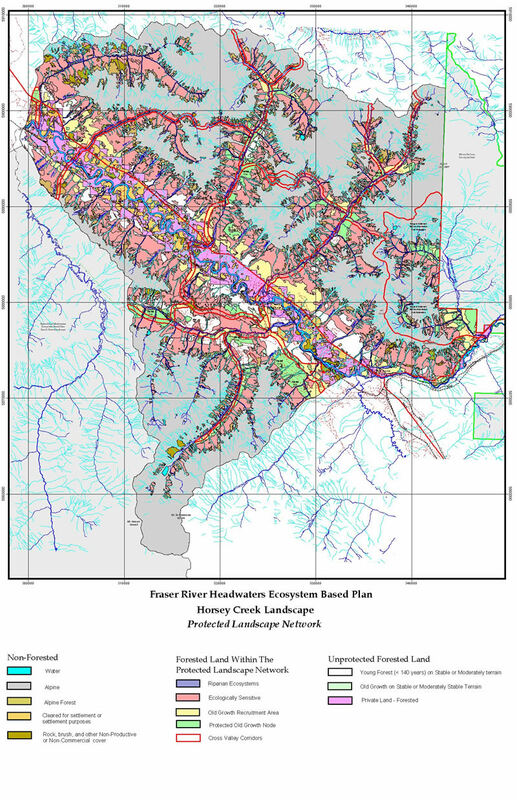 The Horsey Creek ecosystem-based analysis, along with its associated report and maps, was created to provide information to local residents and groups who wish to protect, maintain, and plan for the ecologically sustainable use of the forests and waters of this section of the Fraser River Headwaters. 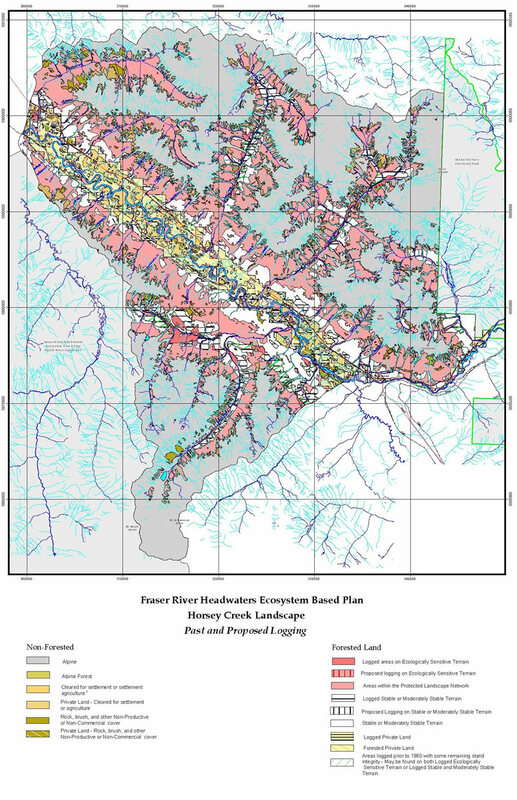 The Horsey Creek analysis is part of an ongoing project to analyze the entire Fraser River Headwaters and to provide ecological connectivity between major park reserves, including Mount Robson and Wells Grey Provincial Parks. develop recommendations to guide the protection, maintenance, and sustainable use of the Horsey Creek Landscape. 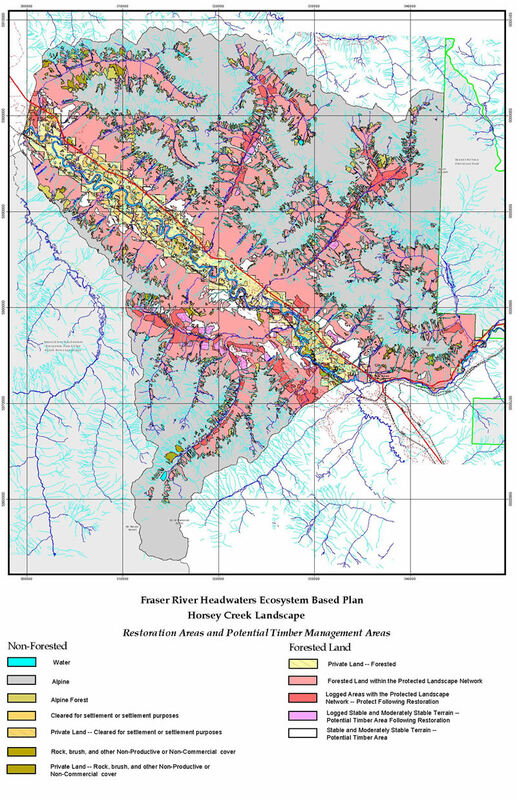 The study area (see map) is approximately 150,000 hectares comprising the wide floodplain, terraces, and valley walls of the Fraser River in the Robson Valley, and its steep tributary watersheds in the Cariboo and Rocky mountains. Elevation ranges from 730 to 3500 meters, and more than 40% of the study area is comprised of alpine tundra. At lower elevations the climate of Horsey Creek varies from a mean daily maximum of 24°C in July to a mean daily minimum of -14°C in January. Its high mean annual precipitation of 700-800 mm creates a productive "interior rainforest" ecology. Higher elevation ecosystems are less productive and are limited by a shorter growing season (due mainly to cooler temperatures and up to 5 meters of snow). The Horsey Creek area contains a gradient of ecological associations that change with elevation from the valley floor to the alpine slopes and meadows. The ecosystems on the northeast side of the Rocky Mountain trench are also adapted to slightly colder and drier conditions than those on the southwest side. The biogeoclimatic subzones (see map) identify four different ecosystems. The Dry Hot Sub Boreal Spruce (SBSdh) subzone occupies the relatively dry and warm floodplain terraces and lower slopes of the Robson Valley. This subzone contains scattered, even-aged stands of Douglas-fir and lodgepole pine, as well as veteran patches of old-growth Douglas-fir, interspersed within a matrix of white spruce and subalpine fir. The Moist Mild Interior Cedar-Hemlock (ICHmm) subzone occupies slightly colder and higher slopes on either side of the trench, and contains a complex structured forest dominated by western red cedar and western hemlock, with minor components of white spruce and subalpine fir. The Moist Mild Engleman Spruce-Subalpine Fir (ESSFmm1) subzone is common in the wetter, colder, middle and upper elevations. The upper elevations are dominated by alpine tundra. Within these biogeoclimatic subzones are several rare plant associations. These communities are marginally productive from a timber management point of view, and they provide important wildlife habitat. More than 50 mammal species occur in the Horsey Creek Landscape, including four that are at risk due to human disturbance and are blue-listed (grizzly bear, wolverine, rocky mountain bighorn sheep, and fisher). Also at risk are three birds, one fish, and sixteen plant species. igh elevations or cold temperatures that reduce productivity. Riparian Ecosystems and Wetlands: Riparian ecosystems include the riparian zone and the riparian zone of influence. These are wet forest areas adjacent to streams, rivers, lakes, and wetlands situated in depressions or valley bottoms. These areas provide a high level of biodiversity, play a crucial role in regulating water flows and water quality, and provide corridors for the movement of plants, animals, and micro-organisms. Alpine: Alpine areas contain extremely sensitive ecosystems which are limited by cold temperatures and a very short growing season. Avalanche Terrain: Avalanche terrain consists of steep, narrow chutes which experience snow avalanches, limiting vegetation to a hardy shrub layer. Complex Terrain: Terrain is considered complex when it contains highly variable, broken topography containing rock outcrops, steep gullies, slides, and fallen rock. Steep Terrain: An area is considered steep if it has slopes greater than 60%. Steep slopes are prone to landslides and erosion, particularly when subjected to road construction and logging. Moderately Stable Terrain: Areas with an average slope between 30% and 60% are considered moderately stable. Small ecologically sensitive areas with rocky knolls, steep slopes, or wetland depressions may occupy up to 50% of the terrain, but overall the terrain contains well-drained, productive soils. Stable Terrain: Stable terrain consists of slopes less than 30% and well-drained, productive soils. Areas that are unsuitable for development (see map) are either where timber management and forest uses are not appropriate because the sites do not support forest vegetation, or because they are highly sensitive to disturbance. While some areas are designated as unsuitable for development, it does not mean that they are unusable for all human activities, such as recreation, nature interpretation, and Indigenous cultural activities. The Ministry of Forests’ development and timber supply planning procedures first identify the "forest landbase"—the amount of forested public land. They then apply a variety of criteria to identify forest landbase "netdowns"-- areas that are subtracted from the timber landbase—such as non-forested, non-productive, non-merchantable, or environmentally sensitive areas. This map combines Ministry of Forests (MoF) designations with SFF's ecological sensitivity to disturbance ratings. This is done to clearly show areas of agreement and areas of difference. The Silva Forest Foundation’s ecological sensitivity analyses add to the MoF unsuitable for development designations because SFF uses more stringent definitions of ecological sensitivity than the MoF. MoF Non-Forested Areas: These areas include water features, rock outcrops, alpine tundra, wetlands, private property, and agricultural clearing. Environmentally Sensitive Area Class 1 and 2. These are areas with significant non-timber values, fragile and unstable soils, or regeneration problems. Inoperable areas. Inoperable areas are considered uneconomic to harvest. Non-Merchantable Forest. These are stands of non-merchantable deciduous trees such as aspen and black cottonwood. Low Site Index. These are areas with low timber growing potential. Inaccessible Areas. These areas are difficult to reach with roads and considered uneconomic to harvest. Silva Riparian Ecosystems: This class contains wetlands and riparian ecosystems. Silva Ecologically Sensitive. This class combines steep terrain, complex or broken terrain, and areas of shallow soils. Landscape development refers to how past and present human activities have affected the landscape. Industrial development in the lower elevations (within the Robson Valley) began in the 1900s and had profound impacts on landscape pattern, forest composition, habitat availability, stream integrity, and wildlife abundance. These impacts were caused by a combination of land clearing for rail and roads, agriculture, and settlement, and it consisted of both logging activities and human-caused fires. Lower elevation forests were all but eliminated. The multi-aged mosaic that included old-growth lodgepole pine and Douglas-fir on drier sites, white spruce and subalpine fir on moist sites, and western red cedar and black cottonwood on wet sites, gave way to a patchwork legacy of roads, fields, and fragmented young forests. The combined impact of this forest conversion was likely devastating to wildlife, leaving little old growth and riparian-forest dependent species, and leaving little low-elevation habitat with few corridors for safe movement. Industrial development since then has had an equally significant impact on landscape and site ecology. Natural disturbances such as stand-replacing fires have been suppressed. Human disturbances have included clearcut logging and fire escapes from slashburning. The result has been both altered species composition and age-class distribution of the Horsey Creek forests. Logging has also eliminated substantial lengths of riparian forests, and associated road construction has altered ground and surface water flows, interrupted wildlife travel routes, and created unnaturally high levels of forest edge. 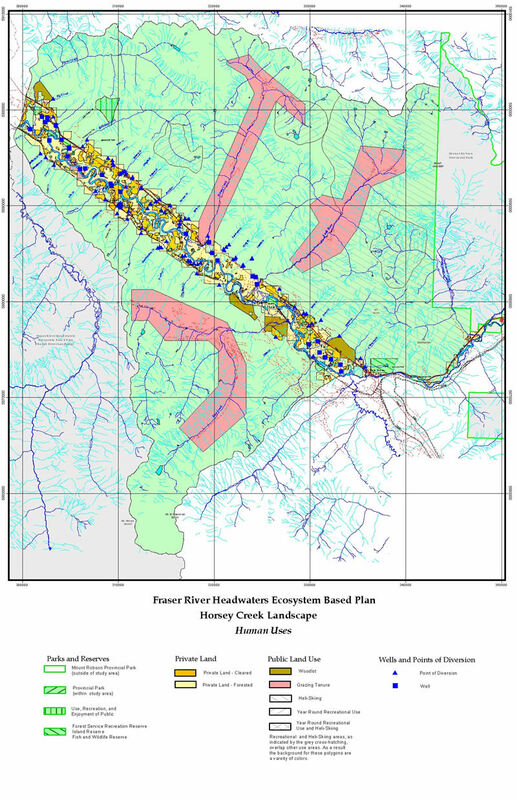 The map shows the location of proposed logging cutblocks as well as the extent of the direct, or “apparent” impacts of past logging that has occurred over the last 40 years within the Horsey Creek landscape. While it isn't displayed here, a map overlay (a see-through map that can be placed over other maps to present additional information) was also created depicting "zones of influence," also known as the edge effects, of past and proposed logging (see map). Zones of influence are areas within forest stands that are impacted by adjacent activities, such as logging roads and clearcuts. Physical impacts include changes in air temperature, soil temperature, humidity, and solar radiation. Biological impacts include changes in species compositon, species structure, and population dynamics. Zones of influence for different impacts usually extend from as little as 1 meter up to 500 meters. Some impacts occur at an even greater distance; spotted owl reproduction, for example, can be affected up to 1.1 kilometers from a forest edge. Appendix V of the Horsey Creek Landscape Report, "Assessing the Ecological Impacts of Timber Management: Apparent Impacts, Actual Impacts, and Precautionary Forest Development," describes and references studies on specific impacts from edge effects or zones of influence. Ecological research over the past two centuries has transformed our understanding of the role that old-growth forest stands and large old trees play in overall landscape and ecosystem function. At the landscape level, patches of old growth provide critical habitat requirements for such species as deer and elk in winter. Many plant, amphibian, and invertebrate species also depend on the moist, moderated "interior" climate found only within old-growth forests during summer months. Old-growth forests usually contain a higher level of biodiversity than younger forests and provide habitat for many old-growth dependent plant and animal species. At the stand scale, the structural diversity—small and large diameter trees, snags, and downed logs, as well as multi-layered canopies—common in many old-growth forests is not found in younger and planted forests. The distribution of remaining old-growth forests in the Horsey Creek landscape was created from a combination of the MoF forest cover databases and aerial photo interpretation. The MoF datasets used were stand height, age class, and dominant tree species combinations. While this data is designed to identify specific stands of old trees by species type, they may not be a completely reliable indicator of fully functioning old-growth forests. Clearly, the majority of remaining old-growth forests lie in the tributary watersheds, while only few remain in the Robson Valley section (within private land). Conservation easements or land trusts should be considered as a means of protecting these remnant stands on private lands. The majority of remaining old-growth forests are also dominated by Engleman spruce and subalpine fir. Douglas-fir, western red cedar, and western hemlock old-growth stands, which used to be common at lower elevations in the Horsey Creek landscape, now occupy less than 1% of the landscape. Indeed, nearly all old-growth forests have been eliminated from the floodplains, terraces, and lower slopes on either side of the Fraser River, as well as from the most productive valley bottom sites in the Horsey Creek Landscape. 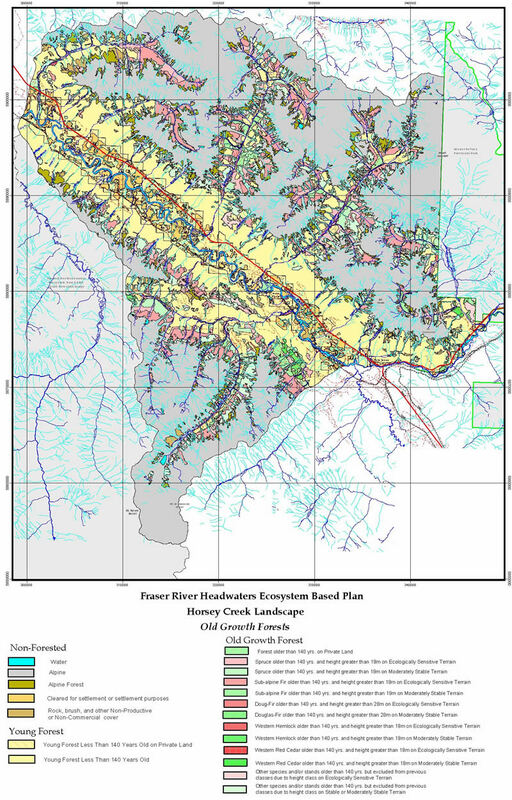 Current human uses (see map) in the Horsey Creek Landscape include continued settlement and agriculture on private lands located on the Fraser River floodplain terraces, a small amount of logging in the Small and Horsey Creek watersheds, and backcountry recreational activities in portions of all tributary watersheds. Grazing leases are used in the Kiwa, Small, and Horsey Creek Watersheds. Settlement in the Robson Valley remains sparse, but the amount of land cleared for development and agriculture increased in recent years. Forests regenerating on unused private lands are beginning to recover structural characteristics such as mature trees, snags, and downed logs. Undisturbed forest landscapes contain a spatially diverse and a temporally variable mosaic of ecosystems and habitats. Conventional timber management and other development activities typically impose disturbances and create landscape patterns that differ ecologically from those that occur naturally. The purpose of a protected landscape network (PLN) is to maintain, and, where necessary, restore important patterns and processes that sustain the ecological functioning of the landscape. A PLN maintains these components as a permanent mosaic of ecological reserves that can only be used for non-extractive activities such hiking, and for “light impact” extractive activities (such as wild mushroom harvesting) where appropriate. 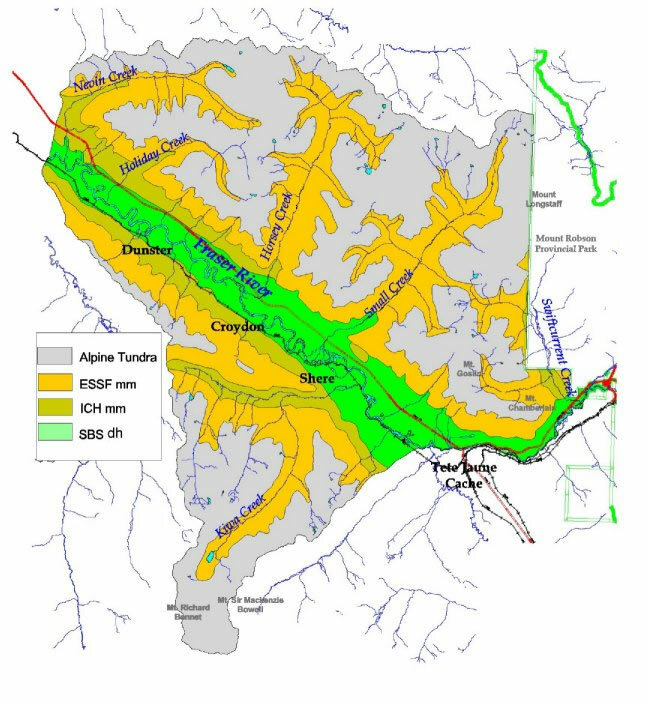 The network of connecting corridors and small protected areas that are added to the sensitive areas are designed using air photo interpretation, GIS analysis, and knowledge of landscape ecology and habitat requirements. The two major protected areas in the region encompassing the Horsey Creek Landscape are Robson Provincial Park to the east, and Wells Grey Provincial Park to the southwest. 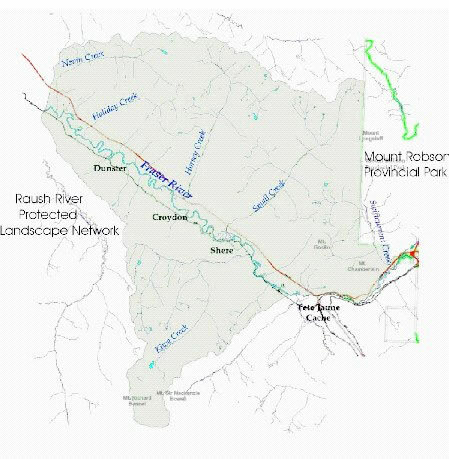 The tested landscape network establishes connectivity between these existing protected areas and the Horsey Creek landscape. Connectivity within the Horsey Creek landscape is provided by riparian and cross-valley corridors. The landscape connections are designed to take advantage of topography, land ownership, and ecological features that allow movement across the landscape. Restoring a natural distribution of stand age classes within the Horsey Creek Landscape will involve recruiting old-growth compositional and structural characteristics within existing younger forest stands. 5. Rare Ecosystems and Biodiversity "Hotspots"
In addition to the rare old-growth forests on stable terrain discussed above, the rare ecosystems and biodiversity hotspots within the proposed protected landscape network include riparian ecosystems, wetlands, and the Tete Creek Corridor. The field studies necessary to identify habitat for rare, threatened, or at risk species and plant communities were beyond the scope of this project. The PLN is designed with the intention of providing a general measure of protection for a broad range of threatened species. As the location of threatened animal, plant, and plant communities are identified, additional reserves may be included in the PLN. The final step in ecosystem-based landscape analysis involves identifying where and when a variety of ecologically responsible forest use activities can occur in areas that lie in between the components of the protected landscape network. Forest use activities, whether timber cutting, commercial tourism, watershed protection, or botanical forest products harvesting, must be caefully planned and executed to ensure the protection and maintenance of fully functioning ecosystems. Ecotourism Areas. The priority use for these areas is ecologically responsible activities such as wildlife viewing, bird watching, backpacking, kayaking and canoeing, photography, and so on. Wildcrafting Areas. Harvesting edible plants, mushrooms, medicinal herbs, and other non-timber forest products is the priority in these areas. Watershed Protection Areas. 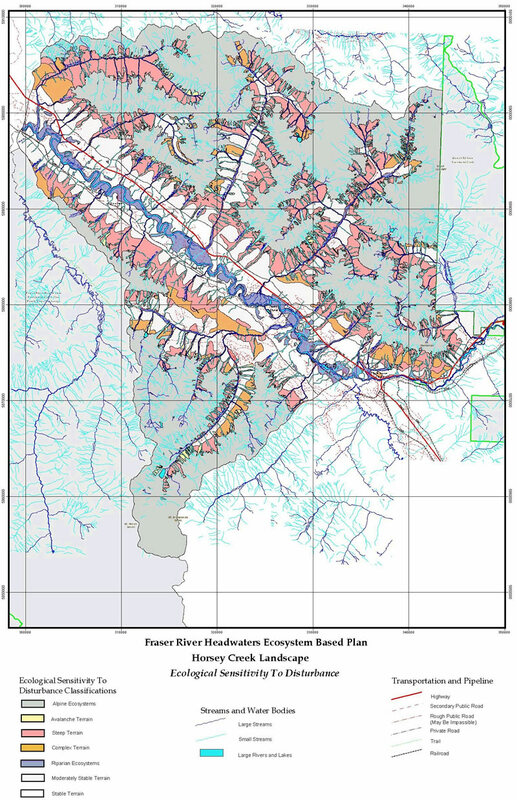 Watershed protection areas are often established in the headwaters of streams that are used as sources of domestic, community, or agricultural water. 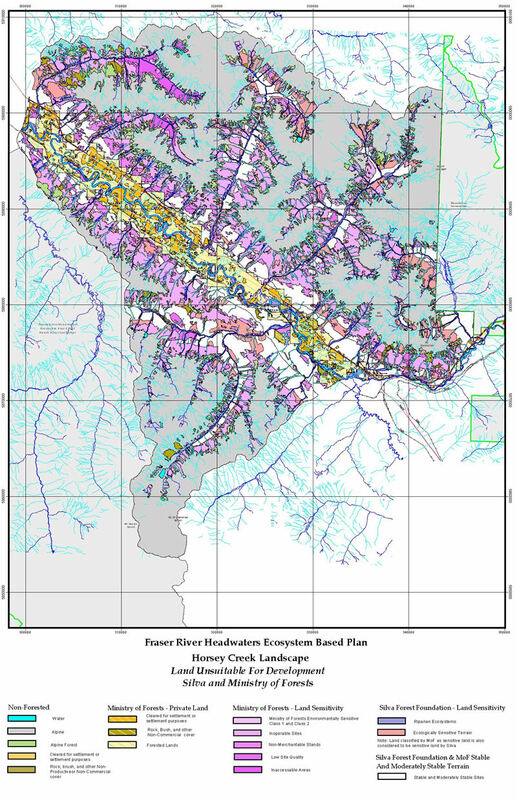 Ecosystem-based Timber Areas. Timber cutting can occur in areas of stable or moderately stable terrain. Within stable and moderately stable terrain, logging systems are designed to maintain or restore the ecological integrity of the forests. Restoration Zones ES are ecologically sensitive areas that have been clearcut in the recent past. These areas will become part of the protected landscape network as restoration proceeds. Restoration Zones MS are areas on moderately stable and stable terrain that contain clearcuts or stands that have been high-graded. These zones are located on productive sites, and can be considered for partial cutting following site assessment and sufficient time to allow for restoration of natural composition and structure. Potential Timber Management Zones are areas containing productive young, mature, and unprotected old-growth forests located on stable and moderately stable slopes. Partial cutting can be carried out in these areas following the determination of an ecologically responsible cutting rate for the Horsey Creek Landscape, and development of ecosystem-based forestry prescriptions, which include protected ecosystem networks (PENs) and full cycle trees.